This wonderful Mediterranean dish probably has as many recipes as those who prepare it. Please use this recipe as a point of departure for you to add or subtract according to your taste. 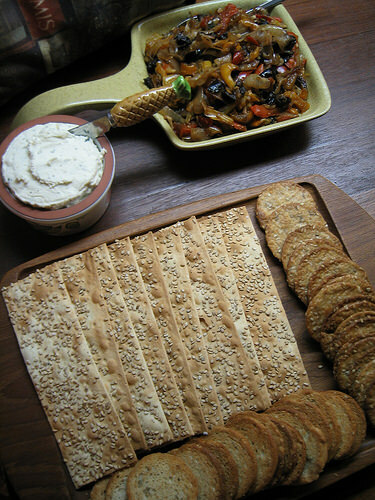 This dish is a mainstay Thanksgiving appetizer, served with boursin and London Townehouse crackers, really a scrumptious combination. Do try it! 6 cups Colored PeppersYou may need about 4 or 5 good size peppers. 2 cups Yellow OnionSliced the same as the peppers, with slices cut in half. ¼ cup Olives, MediterraneanPitted, and cut into pieces about 1/4 inch or so. 1 clove GarlicIf the clove is small, use two. 1 In a large saute pan which has been heated over medium heat, pour the olive oil. Let is heat a few seconds. 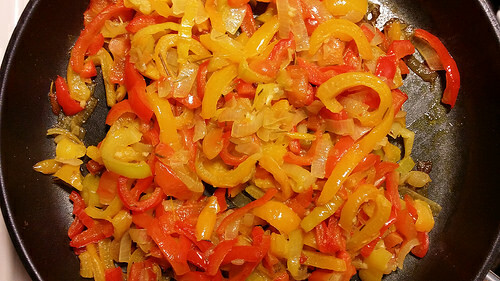 2 Add the peppers and onion. Mix them with a spoon as they begin to saute. 3 Add the salt and rosemary. 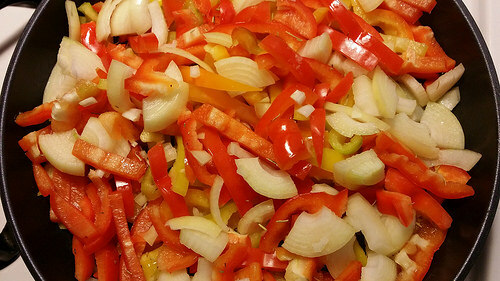 Let this mixture saute for some time until it becomes somewhat the consistency of marmalade. 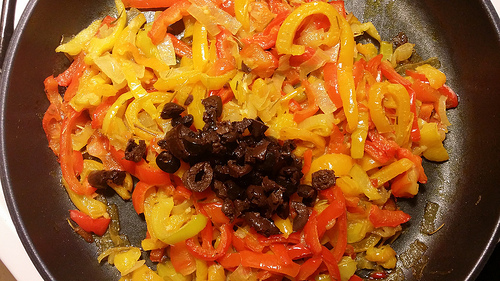 Every once in a while, mix with a spoon to make sure the peppers and onions are cooking similarly. This may take 30 minutes or so, depending on the heat and size of your pan. 4 Add the garlic and cook just a few minutes while stirring. 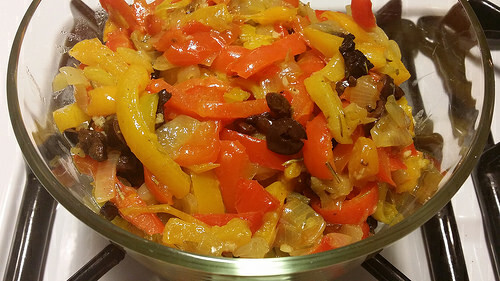 Remove from heat and add the olives. 5 This dish is quite wonderful served at room temperature. It also make a wonderful base for a pasta sauce.